G.O.O.D Music and Hustle Gang artist Travis Scott finally released his long-awaited-mixtape-turned-digital-album Owl Pharaoh today via his website. The project was slated to drop months ago but was delayed due to sample clearance and what seemed to be a very busy schedule from the young artist and producer. The wait seems to be worth it with a sound very reminiscent of his mentor Kanye West, sans any chip on his shoulder. The whole project is worth a long listen with features from A$AP Ferg, Meek Mill, Wale, Toro Y Moi, and Theophilus London. What surprised a number of Travi$ fans was the fact that a many of the singles he had released earlier in the year were not on the project including "UP", "Old English", and "16 Chapels". 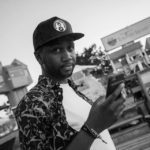 Regardless the project did a good job at showcasing what the world can expect from Travis Scott as he tours the country with friend and fellow Epic Records label mate Casey Veggies. The songs that stood out in my opinion were "Upper Echelon", "MIA" and "Quintana". Download Owl Pharaoh from this XXL freshman. Travis Scott & Metro Boomin take the "Blue Pill"